Q. I've been watching the videos and they keep saying randoms words are important for the GRE. How do I increase my knowledge of GRE vocabulary? A. To improve your vocabulary, it is very important to read as MUCH as possible. This will improve your knowledge of vocabulary in context as well as your comprehension. As you read, make flashcards of the vocabulary words that you don't know. Pause every so often, and recap the main message in your own words. Click on the following links for some suggested reading materials: newspapers and magazines, fiction and nonfiction books. You should also take a look at our vocabulary eBook. It includes 300 of the most commonly tested words on the GRE. In this video, we're going to deal with sentence equivalence questions that are tricky and the idea, or even the mantra, here is read carefully. 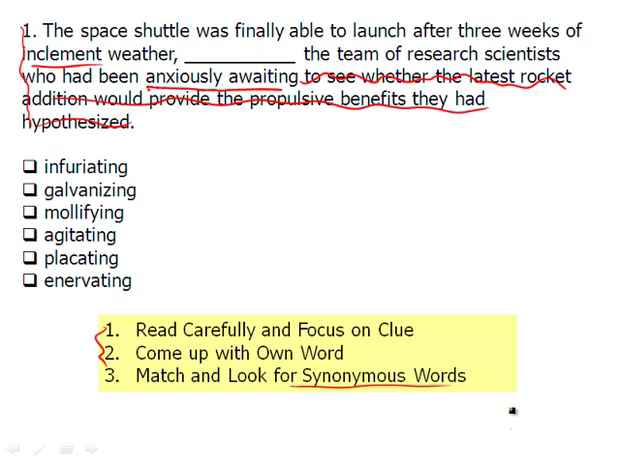 Of course, once we read carefully, we want to follow the usual steps of looking for the clue and coming up with our own word. You'll see that down here and then, of course, finally, we want to make sure that the two words we choose are synonymous words or synonyms. So let's look at this long sentence equivalence question, so let's break it down. "The space shuttle was finally able to launch after three weeks of inclement weather, ________ the team of research scientists who had been anxiously awaiting to see whether the latest rocket addition would provide the propulsive benefits they had hypothesized." So there's a lot of noise going on here. We just want to know about the research team here. What are they like? How are they feeling about this space shuttle launch that's been delayed while they were anxiously awaiting all these weeks? Is it going to take off, is it going to take off? You have this inclement weather here I underlined at the top. Inclement means unpleasant. You can infer that from context. And finally, it takes off after three weeks bad weather. So if they were anxious, what's the liftoff of the space shuttle going to do? It's going to take this anxiety here and it's going to get rid of it, so it's going to lessen the anxiety. So we want a word here that means to calm down or to reassure, something of that nature that's going to be our own word. Now, if we look here at the first word, it's infuriating. Now, this may be a very tempting answer choice, but if we read carefully, we know that they're actually happy that they've finally took off because they had been anxiously awaiting. They wouldn't be infuriated that it was taking off. It seems that maybe they were infuriated before, but not now. So that's again a trap. Galvanizing. If something galvanizes you, it makes you stronger and it urges you on and gives you that extra energy and drive, but that's necessarily what's going on here. We want a word that simply means to get rid of anxiety, and that word here would be mollifying. That's our first answer. Agitating, again, is doing the opposite. They were already agitated. What agitated them was the delay, not the fact that it finally launched. Placating. Placating is a synonym with mollify. It means to soothe, lessen anxiety, in this case. Finally, we have enervating. To enervate means to tire somebody out, so you may think, "Well this whole idea is that it was just enervating for them. It was so tiring, even though it finally took off." If you convince yourself of that interpretation, that's fine, but again, we need synonymous answers. And enervating is definitely not synonymous mollifying and placating. Again, we read carefully, focused on the clue, came up with our own word, and then we went through the answer choices, making sure that those words were synonyms. So let's try another one.